The Judge told Mr Gilroy that he was “sorry” for “the predicament” the applicant found himself in. 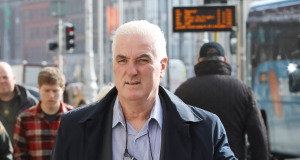 The Judge then revoked Mr Gilroy’s bail, which was granted when the inquiry commenced earlier this month and ordered that the former election candidate be returned to Mountjoy Prison to serve the remainder of the three-month prison term. There was a crowd of approximately forty supporters and friends of Mr Gilroy in Court 2 of the Four Courts when the decision was delivered. The grounds included that the order did not mention Mr Gilroy was to be detained by the Governor of Mountjoy Prison and that the name on the order was allegedly wrong. The court, after being informed that Mr Gilroy had not performed the 80 hours community service, ordered that Mr Gilroy, Riverview, Athlumney Abbey, Navan, Co Meath be detained at Mountjoy Prison.